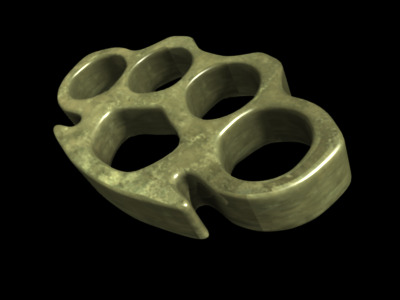 Found on almost every inhabited planet across the galaxy, knucklers are a primitive weapon dating back to times of industrial development. As this industrialization occurred, the populations in many urban areas became denser and crime rates skyrocketed. Its low cost, small size and light weight made this dangerous weapon a popular choice for criminals looking for a concealable weapon. However, due to the progression of societies and advances in technology, they slowly went out of fashion; replaced by far more potent weapons. Made with soft, malleable metals, this silent melee weapon is designed to cover the knuckles of the hand, hence the name, and features a rounded palm grip to absorb the recoil of a punch that might otherwise damage the attacker's hand. Most of the time knucklers curve across the knuckles, but some feature raised protrusions, spikes and small cutting edges that turn the knuckler from a simple tool into a violent, destructive implement that can tear tissues or even break bones. Nowadays, with urbanization occurring rapidly on many planets, knucklers have once again gained some popularity as an easily accessible weapon for brigands. Due to their small size and ease of use, civilians have also been known to rely on this weapon for self-defence. Some planets have banned knucklers altogether, due to their history in crimes, but most governments do not consider them worthy of concern compared to the more dangerous weapons found on black markets.